Ancient Greek Thessaly Larissa Horse Silver Drachm in18kt Gold & Diamond Pendant circa 350-325 B.C. 18kt Solid Gold & Diamond Pendant (New - Never worn) Featuring an Authentic Ancient Greek ..
14kt Gold Pendant w Alexander the Great Ancient Greek Silver Tetradrachm Coin 336-323 B.C. 14kt Solid Gold Pendant (New - Never worn) Featuring an Authentic Ancient Greek Alex..
18kt Gold Pendant w Alexander the Great Ancient Greek Silver Tetradrachm Coin 336-323 B.C. 18kt Solid Gold Pendant (New - Never worn) Featuring an Authentic Ancient Greek Alex..
18kt Gold Pendant w/ Ancient Greek Silver Stater Coin Velia Lion circa 305-290 B.C. Authentic Ancient Greek Silver Stater Coin Lucania, Velia circa 305-290 B.C. Lio..
Sterling Silver and 14kt Solid Gold Pendant Featuring a High Grade Au.. Authentic Ancient Greek Silver Stater Aegina SeaTurtle Diameter: 1 3/8" tall x.. Struck in Ancient Greece (Thasos, Thrace) Silver Tetradrachm Circa 140-110 B.C. This bea.. Ancient Greece Silver Horse Coin in Designer 18kt Gold Ring with Diamonds circa 450-400 B.C. Stunning 18kt Gold & Diamond Coin Ring with Authentic Ancient Greek Silver Horse Coin .. Ancient Greece Silver Horse Coin in hand-made 18kt Gold Ring with Rubies circa 470-460 B.C. Stunning 18kt Gold & Ruby Coin Ring with Authentic Ancient Greek Silver Horse Coin Ci.. Authentic Ancient Greek Alexander the Great (336-323 B.C.) 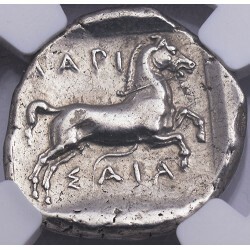 of Macedon Silver Drachm&n.. Authentic Ancient Greek Silver Tetradrachm Attica, Athens Owl Circa 454 - 404 B.C. Mounte.. Ancient Greek Boy on Dolphin Silver Coin in Sterling Silver and 14kt Gold Pendant 280-272 B.C. Ancient Greek Byzantion Cow Silver Drachm in 18kt Gold Pendant 340-320 B.C. 18kt Solid Gold Pendant Featuring an Authentic Ancient Greek Cow Coin .. Ancient Greek Owl Silver Drachm in 18KT Gold Ring with Rubies circa 238-235 B.C. 18kt Solid Gold Ring Featuring an Authentic Ancient Greek Owl Silver.. Ancient Greek Seleukid Silver Tetradrachm in S/S + 14kt Pendant Antiochus VII 138-129 B.C. Solid Sterling Silver & Solid 14kt Gold Pendant Antiochus VII &nbs.. Ancient Greek Thessaly Larissa Horse Silver Drachm in 14kt Gold Pendant circa 350-325 B.C. 14kt Solid Gold Pendant (New - Never worn) Featuring an Authentic Ancient Greek Horse Coin Cir.. Struck in Ancient Greece (Corinth) Silver Stater Coin Circa 345-307 B.C. This beautiful ..